Our twins aren’t just walking these days. They’re running pell-mell around the house and getting into everything. 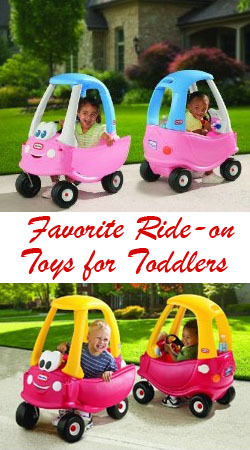 We’re in the market for some ride-on toddler toys to help spend that pent-up energy. Preferably, we’d like toys that they can ride both outdoors (while the weather holds) and indoors. And we have the extra complication of twin boys (toddlers) and their older sister, so any ride-on toys we get need to be sharing-friendly. Otherwise it’ll be a constant state of civil war around here. Durability. Solid construction and the right materials will help them withstand weather, years of play time, and numerous toddler-toddler collisions. 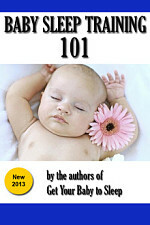 Toddler appeal. The cutest and best-made ride on toys won’t do you a lick of good if your toddlers don’t love them. Uniqueness and style. 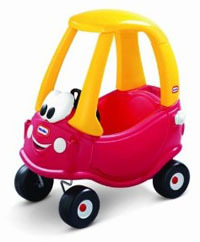 Okay, so I do include the Cozy Coupe which is a classic. But how often do you see that in pink? We love toys that are unique in shape, form, and colors. 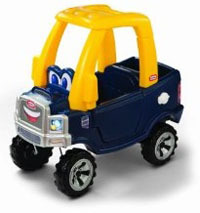 This is the classic ride-on toy for toddlers, one that’s been around for 30 years: the Cozy Coupe. You can push your little toddler around in it, or (when they get a bit bigger) let them push themselves around with feet through the floor panel. It’s decked out with steering wheel, horn, ignition switch, and gas cap. Pair it with the Cozy Gas Pump below for a play set that engages 2 or more kids with minimal bickering. This one’s a classic; we have this original model as well as the Princess version below. Working gas cap and driver’s door. 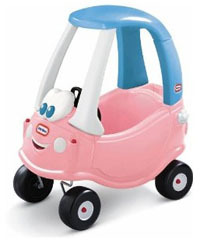 The “princess” version of the Cozy Coupe is essentially the same, except that it’s pink with a powder blue roof. We got this one for our little princess and she just loves it (so do her little brothers, but we’re working on that). They love the fact that the door opens and closes (it even latches shut) to make them feel like a little driver. This car is very sturdy — we keep ours out in the garage — and handles the weather well too. You can cover the bottom panel opening and keep a smaller child in there to play while you’re outside grilling or raking leaves or whatever. We’ve never had the car tip, and the kids just love playing with the steering wheel and horn. 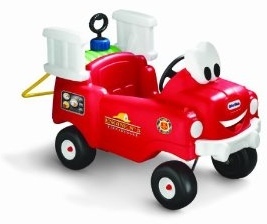 You can go the other way for your tough little guy or gal with this Little Tikes truck. It’s a rugged design, complete with off-road wheels, a flat bed in the back, and a tailgate that opens and closes. The tailgate will hands-down be your kids’ favorite feature. For your future hunter, fisher, or outdoorsman, this is the ride-on toy to get. All three of our kids were firefighters for Halloween — I’m told it’s usually a fairly popular costume — and it seems like every little kid wants to grow up and be a firefighter. Here’s your chance to give them that dream right now, with a friendly truck that they can ride around and even squirt water from! With all of those vehicles riding around, you’re going to need to run a little gas station to fill them up. We have this little pumping station at home (along with the Princess Coupe) and the kids just love it. 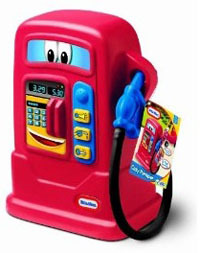 The pull up their vehicles, pump in some gas, pretend to pay and press lots of the beeping buttons, and then head on their way. It’s surprisingly compact and durable, and a great way to let two kids “play” with the car at once.